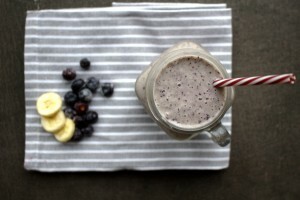 Blueberry and Banana Smoothie - A healthy pick me up! DAIRY-FREE, REFINED SUGAR-FREE, PALEO, SPECIFIC CARBOHYDRATE DIET (SCD). I don’t have smoothies everyday but they are my perfect treat if I need a pick-me-up. Yesterday was just one of those days for me. The housework seemed endless, my little girl was sick and the weather was so terrible we couldn’t even venture outside. This Blueberry and Banana Smoothie came to save the day. I made a double batch yesterday afternoon: enough for me and my daughter to share and then took the leftovers to work this morning. My daughter loves smoothies. It seems though that the colour of the smoothie is the most important to her. This purple one was a big hit! Getting her to try my favourite spinach one can be quite a challenge however! A great tip for making smoothies is to freeze as much fruit as you can in advance. If you see fruit on offer in the shop, then purchase extra and freeze for making smoothies later. Most fruits need to be frozen first on baking trays lined with parchment for at least two hours. Then I usually transfer them to freezer-safe containers. See how I freeze bananas here. After the initial two hours, you can even freeze everything you need for a particular smoothie together in a freezer bag. So for example for this smoothie, you would place the frozen banana and 1/2 cup frozen blueberries together. That way, it’s ready to pull out when you want a smoothie at a moment’s notice. The secret to the deliciousness of this Blueberry and Banana Smoothie is in the combination of coconut water and coconut milk. 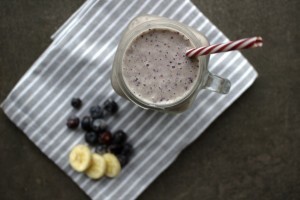 It blends perfectly with the blueberries and bananas to create the perfect dairy-free treat for even the dullest of days! As always be careful which brand of coconut milk and coconut water you buy. They should contain no hidden illegals. Watch out in particular for gums, sweeteners or preservatives. A delicious dairy and refined sugar-free smoothie packed with healthy fats and some superfood goodness! Mix all the ingredients in a blender until smooth. Best enjoyed immediately.